The 18th century ‘L’ shaped Joiners Shop has been completely re-furbished. 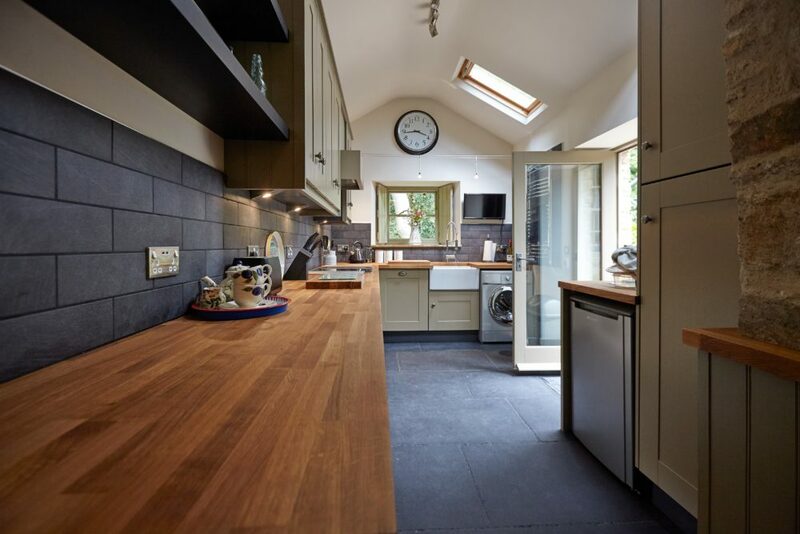 Retaining as much of the original stone walls, slate roof and internal beams whilst incorporating modern insulation to the floors, walls and roof space…creating an extremely comfortable and warm building. 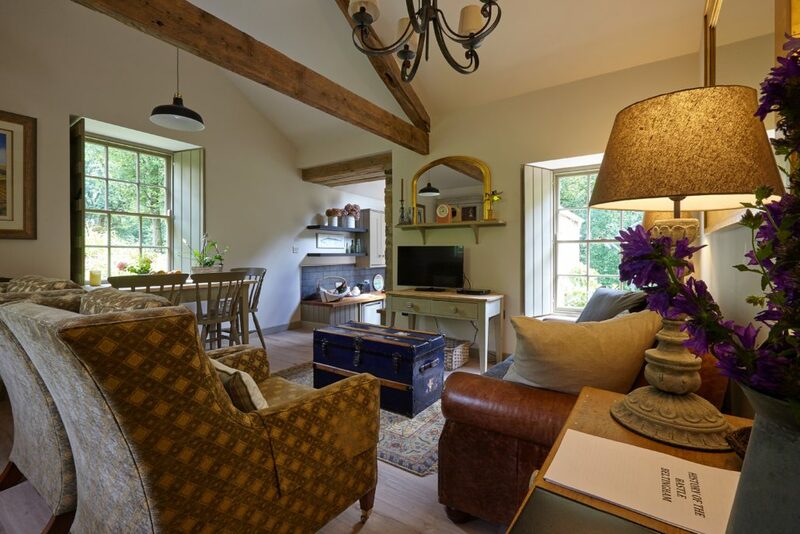 Light and airy SITTING ROOM with three windows overlooking St Cuthbert’s Church and Beltingham Burn, all with wooden shutters for privacy and cosy winter evenings. Vaulted ceiling, beams with a large, iron chandelier, Tetrad leather and Harris Tweed sofa, 2 comfortable, Duresta armchairs, old pine and painted furniture, dining table to seat 4 overlooking the church, 32 inch smart TV and bluray DVD player. Coir covered steps to the KITCHEN…. with Farrow and Ball painted units, oak worktops, Belfast sink, oven, induction hob, microwave, fridge, freezer, dishwasher and washing machine. Black limestone flagged floor with underfloor heating. 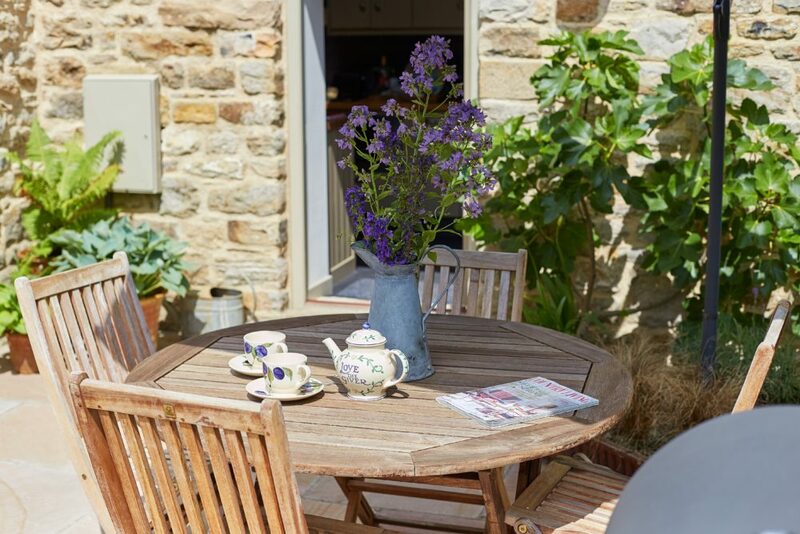 Rear door leading to the superb south west facing, private, paved seating area with table, chairs and BBQ. Gates provide extra security for children and dogs. Ledge and brace door with iron thumb latch lead from the Sitting room to the hallway, bedrooms and bathroom. 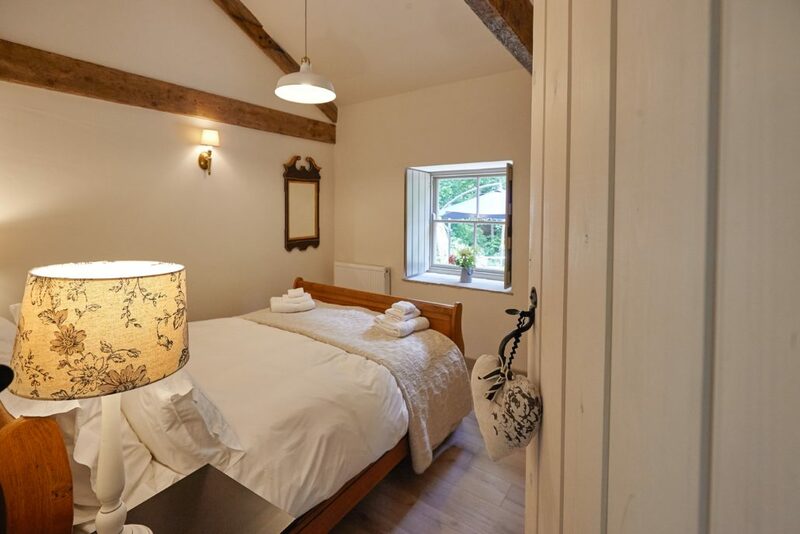 Vaulted ceiling , shutters, French oak king size (5ft) sleigh bed, comfortable, pocket sprung mattress, feather and down duvet, pillows and Egyptian cotton bedlinen. Chest of drawers and contemporary hanging rack for clothes. 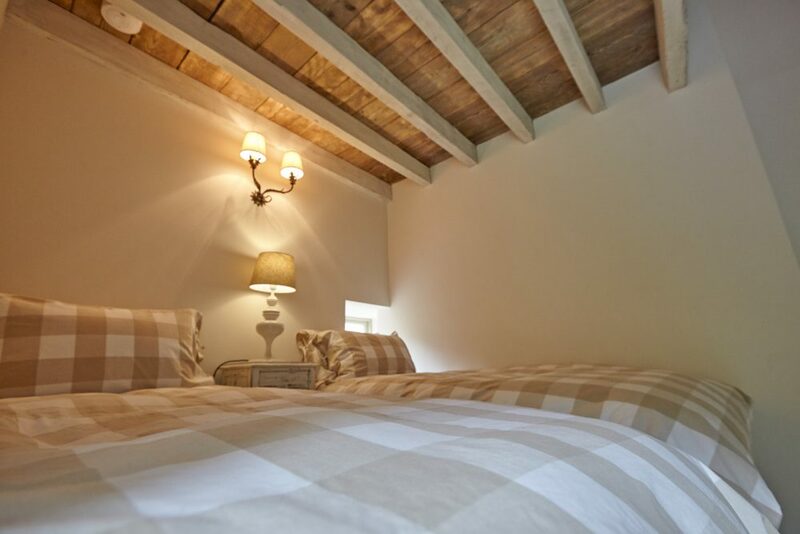 Part vaulted and beamed ceiling with twin single (3ft) beds, feather and down duvets, pillows and Egyptian cotton bedlinen. Painted wardrobe, table and chair. Door leading to the private seating/parking space overlooking Beltingham Burn. 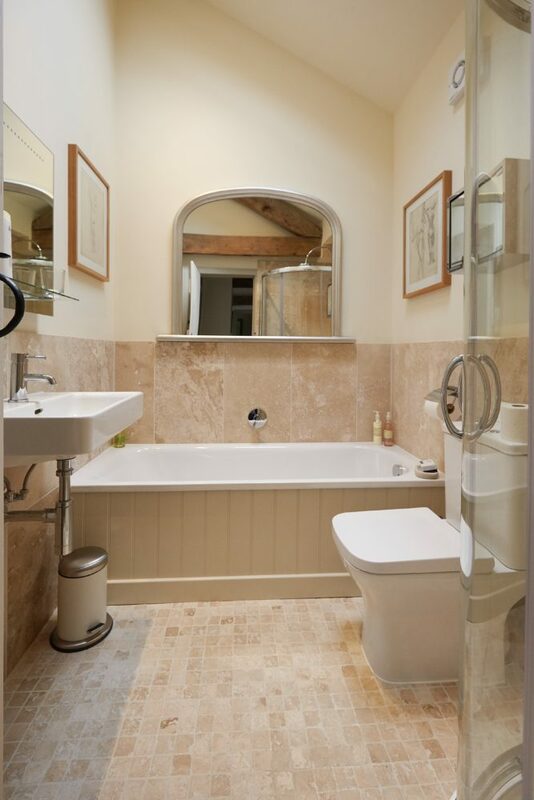 Luxury bathroom with bath, WC, separate power shower with rain head, natural stone tiling, heated towel rail and a touch activated mirror with shaver socket on the side. The Bastle is a Grade II listed fortified farmhouse. Built in Tudor times when Elizabeth I was Queen, William Shakespeare was penning his sonnets and the infamous Border Reivers were raiding across the English / Scottish borderlands, devastating local communities in the 16th / 17th centuries.